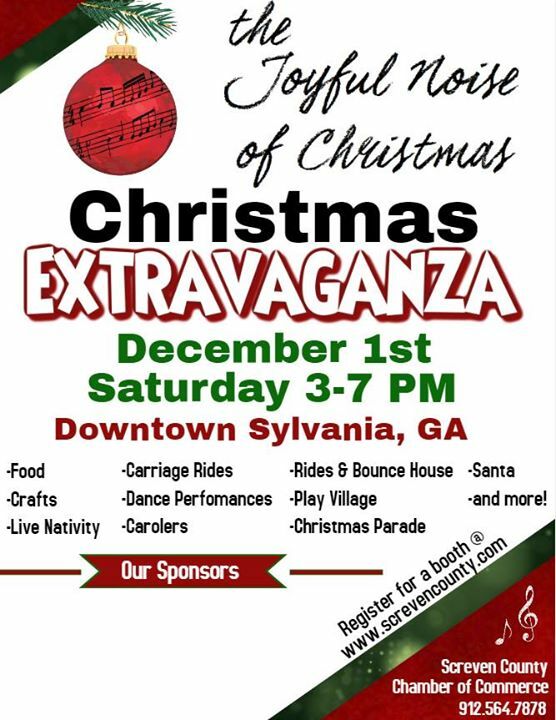 Join Screven County in downtown Sylvania, GA, as we celebrate the holiday with our annual Christmas Extravaganza. This year’s theme will be “The Joyful Noise of Christmas”. Businesses will pick their favorite Christmas song and decorate accordingly. We will kick off the festival with our Christmas Parade, then you can go and visit the Live Nativity, sing with our Victorian Carolers, play in the Bouncy Houses, ride the Amusement Rides, watch as our local talent performs, taste the delicious food, shop at our Downtown stores or the craft vendors, and of course there will be Santa and more! !